Boca Raton, FL – July 25, 2016 – Specialty-specific health information technology company Modernizing Medicine, Inc. today revealed the latest edition of its software, modmed 5.0, a comprehensive specialty-specific suite developed to address the diverse and growing needs of medical practices. 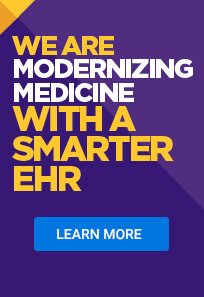 The update includes products and services to help transform the clinical, financial and operational aspects of specialty practices, plus product enhancements to EMA™, the company’s flagship electronic health record (EHR) system developed by practicing physicians. To see modmed 5.0, watch this video. For more information about Modernizing Medicine, please visit the website at www.modmed.com.